“From the beginning of this process, I have been at pains to make this place work. Unfortunately, we have learned that there are people within these institutions who only see the future through the prism of one section of the community; that is not a sustainable way to move forward and I am not going to be part of that.” So said Martin McGuinness on Monday, after a frustrating round of talks with the DUP. The joint first minister said nationalists were waiting for the DUP to deliver and honour their commitments that all of the parties had signed up three years ago – commitments under the terms of an agreement that was presided over by the Irish and British governments. McGuinness said the parties had moved forward decisively at St. Andrews to ensure that the North’s power sharing institutions would work. Failure to honour outstanding commitments was undermining the workings of the power those institutions, he said. 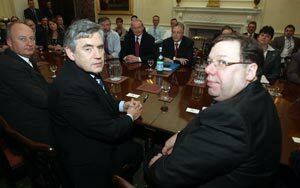 The unscheduled arrival a few hours later of the Irish Taoiseach, Brian Cowen, and British Prime Minister Gordon Brown at Hillsborough Castle to “assist and facilitate” the talks process underscored the serious nature of the political impasse. Both premiers had been meeting in Downing Street on Monday morning when the depth of the political crisis within the north’s power sharing institutions became evident. Within hours Brown and Cowen had cleared their diaries and travelled to Belfast to engage in talks that had begun almost a week ago. Initially, some commentators had predicted that the DUP would enter into talks with a measure of humility that would render a deal more likely. Announcement of the talks had accompanied the DUP’s announcement that their party leader, Peter Robinson, would be standing down as First Minister in the wake of the financial and personal scandal surrounding his wife and fellow MLA, Iris Robinson. But within days it became clear that the DUP was not engaging in complete good faith. Talks, which had continued from last Wednesday through to Saturday, were suspended at the request of the DUP, citing religious commitments. DUP negotiators claimed members of their team could not engage in the discussions on a Sunday because of their strict observance of the Sabbath. But by Monday news that unionists, including members of the DUP’s negotiating team, had travelled to England for a secret meeting with the British Conservative Party on Sunday, exposed that lie. The meeting was held at the home of British aristocrat, the Marquis of Salisbury, a Tory grandee and part of the anti peace process sect within the British establishment. Peter Robinson, Nigel Dodds and Sammy Wilson were joined by senior members of the UUP in what appears to have been an attempted Tory-sponsored unionist electoral pact. This move was not only at odds with the current British government’s commitments to the peace process but also with David Cameron’s stated aim to field nonsectarian candidates in the north. Sadly, it appears that in pursuit of sectional party interests, the British Conservative Party was considering jettisoning progress in the north of Ireland to secure Orange support in Westminster. Meanwhile, emerging from a Dublin meeting of Sinn Féin’s Ard Chomhairle on Saturday afternoon, party President Gerry Adams said in his view, with the necessary political will, all of these matters could and should have been sorted out before now. “Within three months of the St. Andrews Agreement, Sinn Féin had held an Ard Fheis on policing and had fulfilled our obligations,” he said. “That was three years ago and we are waiting on the DUP to honour theirs. The failure thus far by the DUP to honour this St. Andrews obligation is symptomatic of a much bigger problem – their refusal to work partnership government, and in particular to work the office of OFM/DFM properly,” he said. “The only agreement worth reaching is one which deals with this core issue. The political institutions can work and can deliver – but only if they function on the basis they were established. They are not sustainable otherwise,” said Adams. Adams said the Ard Chomhairle had instructed Martin McGuinness to seek an urgent meeting with the leader of the DUP, Peter Robinson. The Sinn Féin president went on to point out that the two governments, who were guarantors of the St. Andrews and Good Friday agreements, were also in default on outstanding issues, particularly equality issues like Irish language rights and the North/South structures. The British and Irish governments were not referees but guarantors with responsibilities and obligations, said Adams. “What we are about is fixing the problems and returning to the basis upon which these institutions were established – Good Friday Agreement and St. Andrews Agreement,” said Adams. The DUP announced it was “ready to discuss outstanding matters”. The meeting between Martin McGuinness and Peter Robinson took place on Monday at Stormont with neither side disclosing any progress. The meeting was described as courteous but the decision of the British PM and Irish Taoiseach to fly immediately to Belfast left few in any doubt that the difficulties remained unresolved. By Monday evening the parties had joined the two governments at Hillsborough Castle. At a 9.30pm press conference outside the castle, Irish Minister Mícheál Martin, who had joined the British Secretary of State Shaun Woodward at Hillsborough, announced the Taoiseach and the prime minister would be working through the night and resume talks on Tuesday morning. It had been a long day, with speculation that Martin McGuiness was on the verge of resigning from the Executive, a decision which would have compelled the British government to announce an Assembly election within seven days. With the DUP still demanding arbitrary preconditions such as the abolition of the Parades Commission, there seemed little hope of progress. It seemed inconceivable that any political party, even unionist, would be proposing to hand the Orange Order a veto over the entire political process in the north. The DUP had cited unionist ‘confidence’ as key to the transfer of policing and justice powers but what confidence could the nationalist community have in power sharing with unionists if they were determined to elevate one of the most notoriously anti Catholic organisations, the Orange Order, to take precedence over democratically elected politicians? In a replay of the night before, the parties and two governments continued their discussions late into Tuesday night and the early hours of Wednesday morning.